Automatic Power Off Switch has been discontinued. The APS-12 is basically a voltage controlled switch. When the vehicle voltage is 13.0 V or higher, the relay turns ON and power is provided to the load side (solid Green LED is ON). When the voltage drops below 12.7V the APS-12 will automatically start the timer based on the users preset time setting 2 minutes to 12 hours (flashing Green LED). Once the timer has timed out, the APS-12 relay turns off and power is removed from the load side (flashing Red LED). 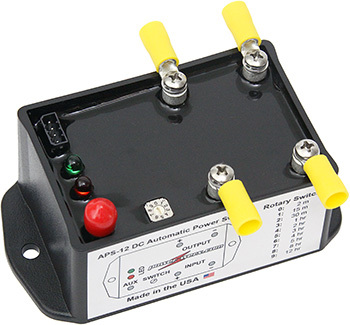 The APS-12 will turn on the load when the vehicle voltage rises above 13.0 volts. This typically occurs within a few seconds of starting the vehicle. The load remains powered as long as the vehicle is on. When the engine is shut off, the vehicle voltage will sink below 12.6V. The APS-12 will start the timer, based on what timer value has been set of the rotary switch. Once the timer has timed out, the unit will turn off the load side. The APS-12 is ideal for use with mobile installations including radios, mobile computers, video cameras, etc.